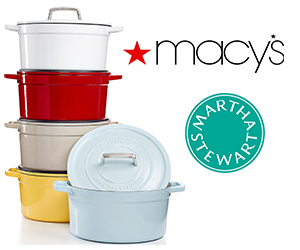 Martha Stewart $180 Cast Iron Casseroles, $39 at Macy’s! Martha Stewart’s line of enamel-covered cast iron casseroles is on sale at Macy’s! The 6-quart size, which usually costs $179.99, is on sale for $59.99 at Macys.com. With a Macy’s rebate worth $20 available from 10/18-10/19, that brings the price down to $39.99. This makes a great addition to your kitchen (perfect in time for Thanksgiving), or makes a great gift to the chef in your family. To get the online price in-store, make sure you download the Macy’s app. Scan the barcode, and bring the product information to the register, where they will match the online price. Happy cooking! Previous Offer: 6 Great Deals on Deodorant and Antiperspirant at Walmart! Next Offer: Honey Bunches of Oats, only $.97 at Rite Aid!